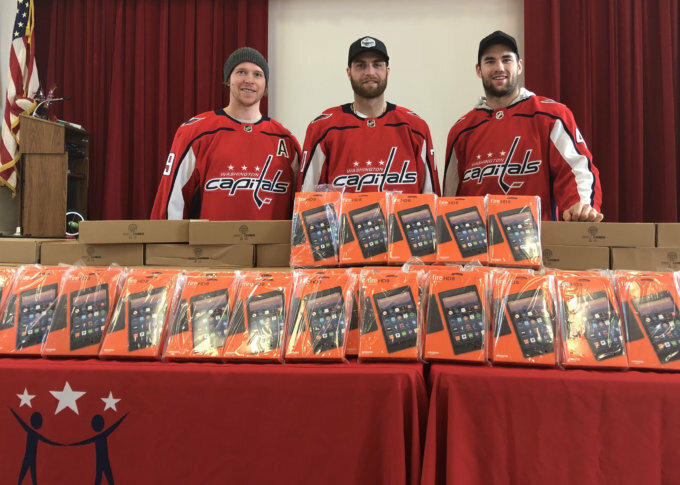 Three Washington Capitals players visited a Southeast D.C. elementary school Tuesday to give laptops and tablets. There was also another gift, much to the surprise of the school's principal. See photos. WASHINGTON — A number of surprises marked the Washington Capitals’ visit to a Southeast D.C. elementary school Tuesday. At an assembly announcing gifts for Hendley Elementary School, students learned from Caps players Nicklas Backstrom and Braden Holtby that when they were in school, their favorite subject was math. The Caps’ Tom Wilson told the kids that his favorite subject was gym class, much to their delight. The principal was also surprised to learn that in addition to the previously announced 45 tablets and 75 laptops from the team’s “So Kids Can” program, the school was going to receive a room makeover as well. The collaborative effort to fund the makeover by the Heart of America Foundation will include Caps players and Elliot Segal of the “Elliot in the Morning Show” donating $50 per Caps win during the regular season and $100 per Caps win during the playoffs. Fans can donate to the program here. Riggins said she couldn’t wait to talk to the kids about the makeover. “We’ll have students weigh in on the process to figure out what room they’d like to transform, what kind of things they’d like in the room,” she said. The Stanley Cup champions were happy to help. “We’re just a small piece of it. We’re happy to be here, and make it a fun day, and give them a big surprise,” Wilson said. Holtby said it was a way to give back. “We’re giving back to our community, especially, and people in need — to just make everyone feel part of a team that way,” he said. For John Flynn, of the Heart of America Foundation, he said helping improve the educational experience for kids is a life’s passion.